Glinton & Northborough Blue/Black Under 15s are pictured before their 4-1 defeat by Riverside. From the left are, back, Dylan McShane, Evan Wright, Sandro Ferreira, Ben Clarke, Matt Major, front, Joseph O'Callaghan, Oliver Hammond, Daniel Thompson and Will Abbott. There were three cracking quarter-final ties in the Peterborough Youth League Under 15 KO Cup competition on Sunday. 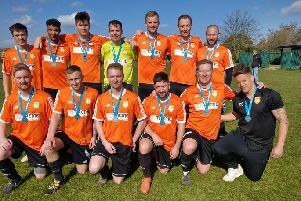 Division One leaders Peterborough Sports made it through to the semi-finals but not without a scare. They were up against Gunthorpe Harriers Navy and needed extra time to edge home 5-4. Star of the show for Sports was Nasir Nabi, who netted four of their goals. Jazleigh Fife got the other while on target for Gunthorpe were Zach Findley, Braden Henson, Tomi Ogunyoye and Christopher Seery. It was also tight between Netherton and Blackstones with the Stamford side nicking a 6-5 victory. Goals by Solomon Walker (2), Kai Wood (2), Shaun Archer and an own goal saw Stones home with Harry Tidswell (3) and Sulaiman Saleem (2) the boys replying for Netherton. The third quarter-final played produced an upset with Spalding from Division Two beating Division One side Whittlesey 3-2 with goals by David Gos, Samuel Burden and Sam Bayly. The fourth quarter-final between Hungate Rovers Green and Glinton & Northborough was postponed. Two of the Under 16 League Cup quarter-finals were also played on Sunday and both went according to form. Division One leaders Northern Star Blue won 3-0 at Rippingale & Folkingham from Division Two while in another One v Two tie it was Hampton who beat Thorpe Wood Rangers 4-0. Isaac Saywell (2), Nandeli Pelembe and Harry Dee scored for Hampton while Daniel Bonser, Oliver Foster and Oluwasegun Okunrinboye netted for Star.